Monday Night Talk teams up with the WATD News Dept. 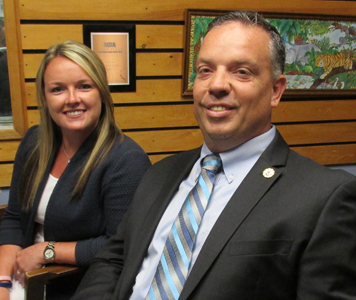 to host a political forum for the 3rd Plymouth District State Representative's seat featuring Republican candidates John Brannan and Kristen Arute. The event was moderated by WATD’s managing news editor Christine James, who also poses questions with MNT host Kevin Tocci and WATD reporter Charles Mathewson. Do you have a topic for a future show or info on an upcoming community event? Email us at mondaynighttalk@gmail.com or "like" and post a comment on our Facebook page: www.facebook.com/mondaynighttalkon959fmwatd. If you're a fan of the show and enjoy our segments, you can either download your favorite segment from this site or subscribe to our podcasts through iTunes today! © Monday Night Talk with Kevin Tocci - 2016. Unauthorized use and/or duplication of this material without express and written permission from the show host and/or owner is strictly prohibited. Monday Night Talk teams up with the WATD News Dept. to host a political forum for the 3rd Plymouth District State Representative's seat featuring Democratic candidates Joan Meschino and Stephen Burm. The event was moderated by WATD’s managing news editor Christine James, who also poses questions with MNT host Kevin Tocci and WATD reporter Charles Mathewson. Do you have a topic for a future show or info on an upcoming community event? Email us at mondaynighttalk@gmail.com or "like" and post a comment on our Facebook page: www.facebook.com/mondaynighttalkon959fmwatd. If you're a fan of the show and enjoy our segments, you can either download your favorite segment from this site or subscribe to our podcasts through iTunes today! © Monday Night Talk with Kevin Tocci - 2016. Unauthorized use and/or duplication of this material without express and written permission from the show host and/or owner is strictly prohibited. Monday Night Talk teams up with the WATD News Dept. to host a political forum for the 1st Plymouth District State Representative's seat featuring Democratic candidates John Mahoney and Stephen Michael Palmer. The event was moderated by WATD’s managing news editor Christine James, who also poses questions with MNT host Kevin Tocci and WATD reporter Charles Mathewson. Do you have a topic for a future show or info on an upcoming community event? Email us at mondaynighttalk@gmail.com or "like" and post a comment on our Facebook page: www.facebook.com/mondaynighttalkon959fmwatd. If you're a fan of the show and enjoy our segments, you can either download your favorite segment from this site or subscribe to our podcasts through iTunes today! © Monday Night Talk with Kevin Tocci - 2016. Unauthorized use and/or duplication of this material without express and written permission from the show host and/or owner is strictly prohibited. 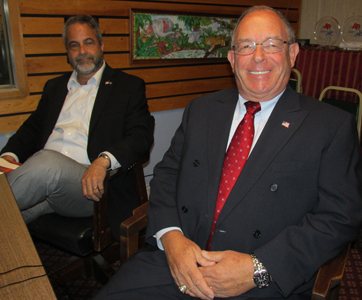 1st Plymouth District State Rep candidates from left to right: Stephen Michael Palmer and John Mahoney. Monday Night Talk teams up with the WATD News Dept. to host a political forum for the 12th Plymouth District State Representative's seat featuring GOP candidates Peter Boncek, Michael Cowett and Ian Murphy. The event was moderated by WATD’s managing news editor Christine James, who also poses questions with MNT host Kevin Tocci and WATD reporter Charles Mathewson. Do you have a topic for a future show or info on an upcoming community event? Email us at mondaynighttalk@gmail.com or "like" and post a comment on our Facebook page: www.facebook.com/mondaynighttalkon959fmwatd. If you're a fan of the show and enjoy our segments, you can either download your favorite segment from this site or subscribe to our podcasts through iTunes today! © Monday Night Talk with Kevin Tocci - 2016. Unauthorized use and/or duplication of this material without express and written permission from the show host and/or owner is strictly prohibited. 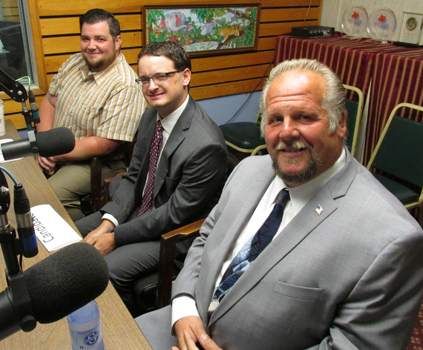 12th Plymouth District State Rep candidates from left to right: Ian Murphy, Michael Cowett and Peter Boncek. 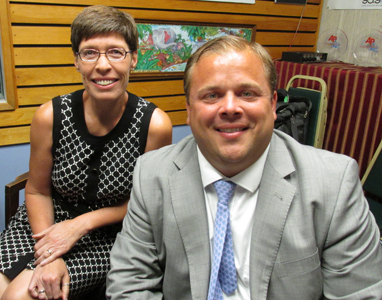 Monday Night Talk hosts a political forum for the 5th Plymouth District State Representative's seat that was held Monday, August 8 featuring Democratic candidates Kara Nyman and Paul Moody. The event was moderated by WATD’s managing news editor Christine James, who also poses questions with MNT host Kevin Tocci and WATD reporter Charles Mathewson. Do you have a topic for a future show or info on an upcoming community event? Email us at mondaynighttalk@gmail.com or "like" and post a comment on our Facebook page: www.facebook.com/mondaynighttalkon959fmwatd. If you're a fan of the show and enjoy our segments, you can either download your favorite segment from this site or subscribe to our podcasts through iTunes today! © Monday Night Talk with Kevin Tocci - 2016. Unauthorized use and/or duplication of this material without express and written permission from the show host and/or owner is strictly prohibited. 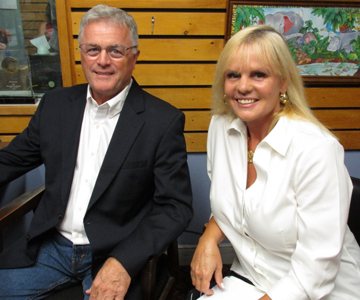 Local musician Bill Bell is a special guest during this segment of Monday Night Talk! 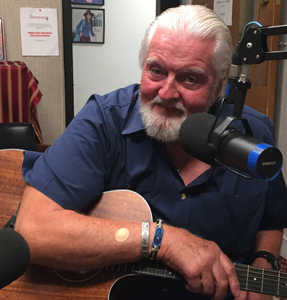 Bill chats with hosts Kevin Tocci and Rich Rosen about his weekly Irish Seisiuns held at McGuiggan's Pub in Whitman and even takes a moment to croon a couple of tunes! Do you have a topic for a future show or info on an upcoming community event? Email us at mondaynighttalk@gmail.com or "like" and post a comment on our Facebook page: www.facebook.com/mondaynighttalkon959fmwatd. If you're a fan of the show and enjoy our segments, you can either download your favorite segment from this site or subscribe to our podcasts through iTunes today! © Monday Night Talk with Kevin Tocci - 2016. Unauthorized use and/or duplication of this material without express and written permission from the show host and/or owner is strictly prohibited. 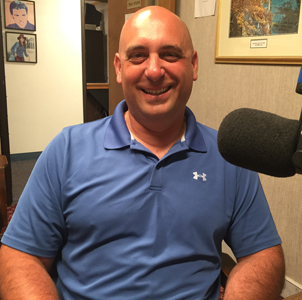 Scott Vecchi, candidate for Plymouth County Sheriff is a guest during this segment of Monday Night Talk! Scott joins hosts Kevin Tocci and Richard Rosen to talk about the latest with the campaign and the issues involved in the race. Do you have a topic for a future show or info on an upcoming community event? Email us at mondaynighttalk@gmail.com or "like" and post a comment on our Facebook page: www.facebook.com/mondaynighttalkon959fmwatd. If you're a fan of the show and enjoy our segments, you can either download your favorite segment from this site or subscribe to our podcasts through iTunes today! © Monday Night Talk with Kevin Tocci - 2016. Unauthorized use and/or duplication of this material without express and written permission from the show host and/or owner is strictly prohibited. 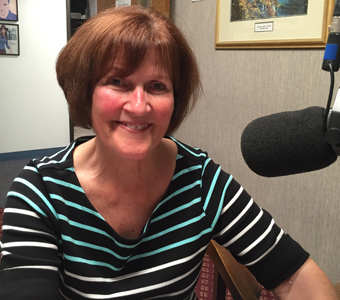 Eileen Scotti, Scituate's Public Health Nurse is a guest during this episode of Monday Night Talk! 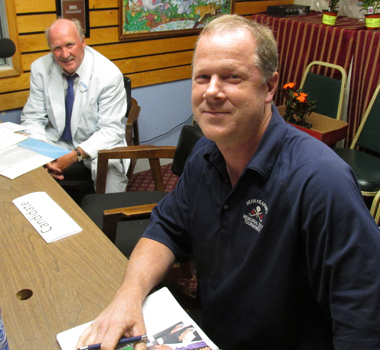 Eileen talks with hosts Kevin Tocci and Richard Rosen about what her office provided for services and also provides details of the Scituate Board of Health hosting Dana-Farber's Mammography Van in September. Do you have a topic for a future show or info on an upcoming community event? Email us at mondaynighttalk@gmail.com or "like" and post a comment on our Facebook page: www.facebook.com/mondaynighttalkon959fmwatd. If you're a fan of the show and enjoy our segments, you can either download your favorite segment from this site or subscribe to our podcasts through iTunes today! © Monday Night Talk with Kevin Tocci - 2016. Unauthorized use and/or duplication of this material without express and written permission from the show host and/or owner is strictly prohibited. 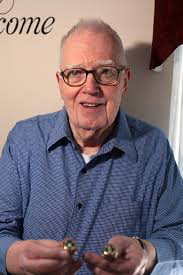 WATD Political Analyst John Creed is a special guest during this episode of Monday Night Talk! John joins hosts Kevin Tocci and Richard Rosen by phone to discuss the Republican and Democratic National Conventions and which party succeeded at energizing voters and their base. Do you have a topic for a future show or info on an upcoming community event? Email us at mondaynighttalk@gmail.com or "like" and post a comment on our Facebook page: www.facebook.com/mondaynighttalkon959fmwatd. If you're a fan of the show and enjoy our segments, you can either download your favorite segment from this site or subscribe to our podcasts through iTunes today! © Monday Night Talk with Kevin Tocci - 2016. Unauthorized use and/or duplication of this material without express and written permission from the show host and/or owner is strictly prohibited.